Chess Checkmated: The Duke | SPACE-BIFF! Today I’m going to introduce you to a game that’s so good, it basically reviews itself, and one of the few games I’d ever recommend to every human being regardless of their taste in other games. As a lifelong amateur of modern Chaturanga (or Chess, if you insist on being vulgar), it’s also the first abstract game I’ve played that’s both reminiscent of that ancient classic and wildly fresh in its own right. Ladies and gentlemen, may I introduce: The Duke. Just like that, you already mostly understand what’s happening. See, You Already Get It! The Duke’s most immediate appeal is in its fine-tuned visual language. Even a peasant wandering in from off the streets, seeking refuge in the toasty shelter of your living room, could peer down at the match playing out betwixt lord and lady, and screech, “Guv’ness, why’d ain’t you put ‘im in checkmate right there?” At least, that’s what happened last night, and it’s why Somerset roundly trounced me in our most recent game. I assure you, that vagrant was back out in the cold on his fluffy backside within minutes. There’s really no overstating it: The Duke is visually perfect. It has a lot of pieces, interacting in an oft-complex manner and transforming its tiny six-by-six board into a treacherous minefield. Move there, and your opponent’s Priest might barrel down at the diagonal and capture your Footman unopposed; remove your Longbowman to a safer position and he’s no longer covering your Wizard, who will undoubtedly become the next victim of your opponent’s Assassin. Each piece follows its own rules, some moving normally, some hopping over other pieces, some sliding, some sliding and hopping, others giving special commands or killing from afar without having to expose themselves to retaliation. And yet, the game is even simpler for a beginner to pick up than Chess, because every single piece shows you exactly what it’s capable of. Well, not exactly what it’s capable of. Only half. But we’re getting ahead of ourselves. We’ll get to that in a moment, after you’ve finished marveling at The Duke’s stunning readability. Good? Are you sure? Alright, fine. You can come back a bit later for more marveling. Some of the double-sided pieces. On each of your turns in The Duke, you have two options. Or rather, you have quite a few options, but only two types of options, both bickering for your attention, demanding you neglect the other for their benefit. The first is to move a piece, following its illustration. Maybe you capture an enemy piece during your move, or slide into a beneficial position — well done! However, the instant you complete a move, you flip the piece over, revealing an entirely different illustration and an entirely new behavior. So your Longbowman starts out very un-Longbowman-like, moving one space in any of the four compass directions, but as soon as he’s shuffled into place, you flip him over to reveal a long-distance murder-machine. Later, his murder-bolts having been flung into the face of an unsuspecting enemy Footman, he flips over again, returning to his original condition. The board is therefore constantly shifting, tiles switching between behaviors as they leap about. It isn’t enough to just observe the static language of the board; you must also learn how The Duke’s units violate the observable conditions by becoming a different version of themselves. Even so, the two sides of each tile are totally logical and therefore simple to remember: for instance, the Assassin specializes in positioning himself to strike, then later for darting forward to execute the kill itself. Likewise, Knights charge forward then hobble backwards, Bowmen carefully position before loosing their stream of arrows, Pikemen alternately march diagonally and hack forwards, and Champions just keep mulching everything in a predictable pattern of doom. And that’s just the first option. The other is to levy, by which I mean you reach into a bag, draw out a new tile at random, and place it adjacent to your Duke. Since the board in The Duke doesn’t assign you a “home row,” you can levy new troops wherever your Duke’s travels may take him, lines constantly re-drawn as both sides seek to entrap the other. Vaguely embarrassing, but in my defense I was about 13 years old. The Duke owes an obvious debt to Chess. The goal is to trap your opponent’s Duke, even to the point that you cannot move your own Duke into danger and must announce “Guard!” when you threaten the opposing Duke (though “Smoke a dookie!” has become accepted vernacular in my group, either because it contains “duke” or because it’s crass). 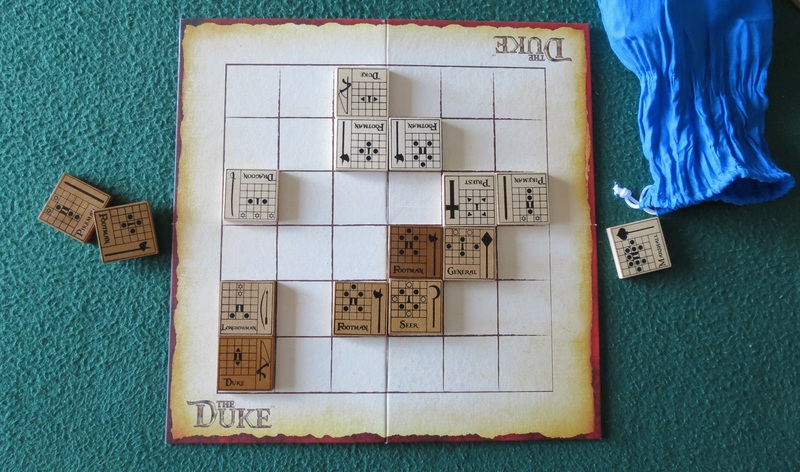 Even so, Dukes are a far cry from the nigh-helpless Kings of Chess, one side of their tile sliding them to the right or left, or forward and backwards on the other. 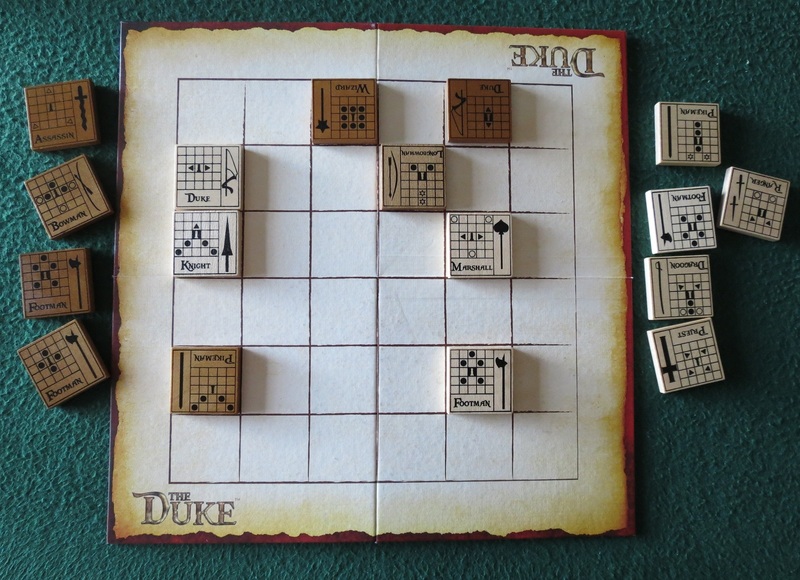 It’s even possible to block many attacks by levying a tile between your Duke and the threatening piece. It’s not uncommon to see players striking a balance between aggressive play, moving their Duke onto the far side of the board for better levying opportunities or to chase the enemy Duke into a trap; and conservative tactics, hiding their Duke behind a wall of carefully-interlocked killers. Best of all, The Duke inherits none of Chess’s unfortunate tedium. Even longer games wrap up in about forty minutes, and most last closer to fifteen. The dash of luck that comes from pulling new tiles from your drawbag means that memorized strategies are an impossibility, and every single match progresses in a totally unique manner. And I assure you, the luck element is a definite second to the game’s skill factor — while it’s possible to draw exactly the right tile at precisely the right moment, this is still a game about outmaneuvering your opponent, putting him into a corner, and doing everything in your power to ensure he can’t get out. Both players working towards a duke-mate. 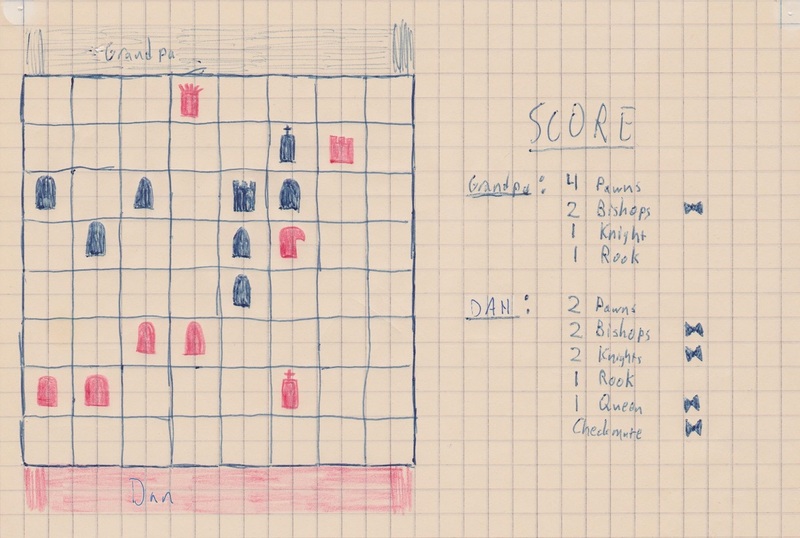 I usually don’t play abstract games, but from now on when I do, it’ll be The Duke. This is one of the leanest, tightest, smartest games I’ve ever played. If you like games at all, you owe yourself to pick up this gem, invest the two minutes it takes to learn, and play the hell out of it. Or at the very least put it on your coffee table and look like the handsomest, most refined bloke your house-guests have ever had the pleasure of making acquaintance. Posted on November 9, 2013, in Board Game and tagged Board Games, Catalyst Game Labs, The Duke, The Fruits of Kickstarter. Bookmark the permalink. 16 Comments. Yet another one for The List. It sounds pretty darn amazing. I’d read about it elsewhere (gasp!) but this has tipped me over the edge. This is exactly what I look for in a Space-Biff! review: some good personal humor, a feel for how the game plays without a boring rewrite of the rulebook, some examples, excellent alt-texts that give me even more info or a chuckle… awesome job Dan! That sure was weird when that homeless guy came into our house. But he got it! Who made this game anyway? Have you tried Jarl? Do you find it as compelling as The Duke? I have not played Jarl yet, though I think it’s being sent to me. If that’s the case, I’ll have impressions sometime later this month. Pingback: Best Week 2013: Head-to-Heads | SPACE-BIFF! Pingback: Best Week 2013: The Index | SPACE-BIFF! Pingback: It Means “Not for Dummies” in Czech | SPACE-BIFF! Pingback: Space-Biff! Was Recently Devastated | SPACE-BIFF! Pingback: Thane You, Jarl Welcome | SPACE-BIFF! Pingback: The Space-Biff! Holiday Survival Guide | SPACE-BIFF! Pingback: Even the Masters Are Pawns | SPACE-BIFF!